Back with another week of hair styles. I wasn't as good this week as previous weeks, but I did do something, so there's that. On Saturday I decided I wanted to try this, I think it turned out pretty good, but I think it would look better on someone who has multi color hair so you can actually see the braids. I had to move to the sun so you could see them when I was taking my pictures, haha. This* sweater, THE MOST COMFORTABLE THING YOU WILL EVER WEAR. There are only x-small and smalls left and it's only $28, seriously go get it now if that's your size, you won't regret it. I added this* white tank top from Target under it so if it fell to one side my bra wouldn't be showing. I'm classy like that. It's hard to show you the whole style, so put together every angle you could possibly want. It's was a super fun hairstyle to wear, and yes I'm still working on the "messy bun" why is it so hard for me?! And then I just a jump shot...because...why not? I tried this hair style on Sunday. This picture doesn't really do it justice, but it was super cute and I am planning on doing it again next week! I think it will go great with the style prompt that I got, but more on that later. Forgot to take a picture of it from the front. But here I am with the kids. My last style for the week was going to WORK OUT!!!! What?! I was so happy to get back to my workout class. This is how I typically do my hair for working out. I french braid it a little and then pull it back into a ponytail. I have a lot of new growth by my hairline, which doesn't always make it into the ponytail, with the braid it gets those hairs out of the way so I'm not constantly pushing them out of my eyes. And picture of the front, a few minutes after class ended, felt great, but boy are my abs sore today, best feeling right? Lady in the middle is the instructor and she's in her early 50's! Can you believe it? She looks great right?! The other lady is a friend in class. Happy to see both of them after 4 months off. So those are my styles this week. My favorite was the double french braid, it was just fun to wear, although towards the end of the night I was ready to take it out, having your hair up like that does a number on the scalp. And now for the big announcement! 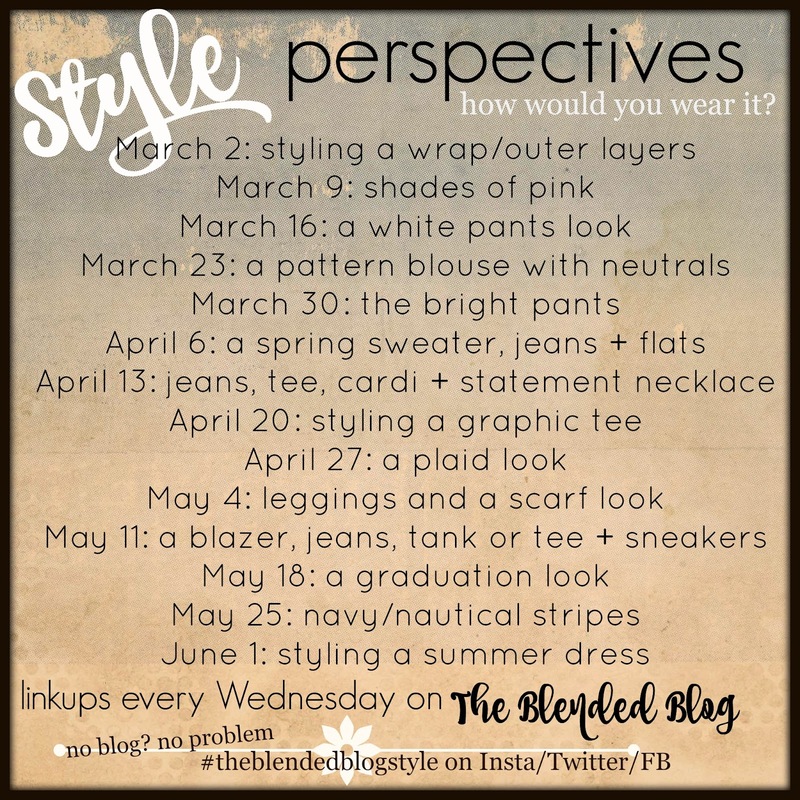 The ladies at The Blended Blog and I have put together a fun series for you! Each of the contributors picked a style that really represents them, and then the rest of the collaborators are going to use that prompt and make it their own. So you'll be seeing each of our takes on the style prompt, you'll get a wide variety of outfits from all different climates and different parts of the US and Canada. How fun is that? And best yet, you can participate too! We're going to do a link up each week starting next week! So get those outfits together and link up and if you don't have a blog, no problem! Just use #theblendedblogstyle on IG, FB and Twitter. 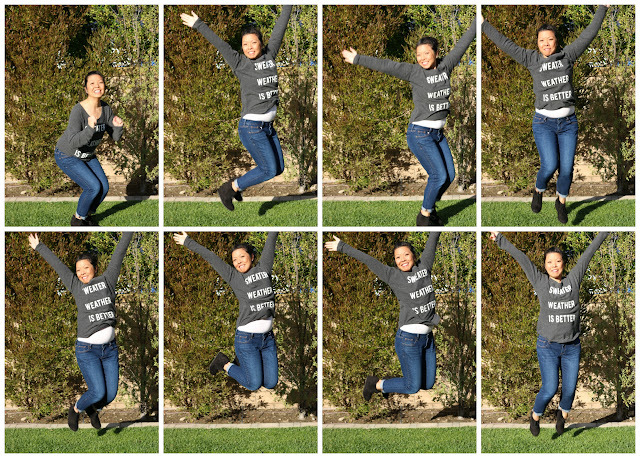 How many times it took me to get that jump shot up there...It was just me and my timer...persistence pays off.